The striking beginning is a daring attempt by the author to both shock and hook the reader, and it works perfectly. My expectations of what to expect from the protagonist were shattered almost immediately, and I was ready to burst with questions: Who exactly is Jorg? What happened to make him this way? How did he fall in with this group of men? Why are they burning villages? To some extent these questions were answered by the end of the book, although never quite in a way I expected. Being coerced into feeling both admiration and sympathy for Jorg was probably the most unexpected result of having these questions answered! The character of Jorg is developed nicely through the first-person narrative. His voice is distinctive and captivating, but also conflicted: sometimes cold and hard, at other times sarcastic and humorous. He seems inhumanly detached from most emotions, and is able to observe tragedy without dwelling on it. However, I also got the sense that this is more of a persona than a personality. Lawrence writes this cleverly: while Jorg is clearly ignorant of what is happening to him emotionally, we as readers are able to recognise and appreciate the gradual emergence of compunction and sympathy. (It’s a subtle development, but one which helps explain the ‘personality change’ others have remarked upon in the sequel). The flashbacks in the story are used to provide insights into events and characters at relevant moments in the plot. Gradually learning about Jorg’s childhood is a great way to develop the character and provoke conflicting responses amongst readers. The flashbacks can occasionally be disorienting, but on the whole they are used effectively to flesh out the story with details that illuminate how the present situation came into being. I also love the bits and pieces that hint about the world of the ‘broken empire’ and the ‘Builders’. I don't really like applying the term ‘unrealistic’ to anything within the fantasy genre, but have found myself giving thought to questions such as: would battle-hardened criminals (such as Rike) really follow such a young boy so willingly? And, even taking into account his extensive royal education in history and tactical warfare, would this boy really be capable of accomplishing so much? I’ve decided that the latter can be explained by the 'guiding hand', while the former may simply be a result of the Brothers’ brutal 'wolf pack' mentality: Jorg becomes the leader by defeating the group’s existing alpha male. But accomplishing all this between the age of ten and fourteen? Really? Just one more minor gripe: I wish there had been a bit more backstory for some of the Brothers rather than just the occasional anecdote or one-liner between chapters. Jorg might not care much about them, but I wanted to know more. This is a dark novel, though not as dark as others would have you believe. The characters are entertaining, the world is fascinating, and some of the imagery (the Leucrota, the necromancer and the ‘Builder’s sun’ spring to mind) is staggering. Many readers were alienated by the beginning. . . I read right to the very end and wanted more. 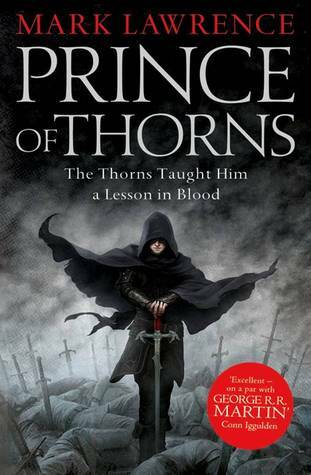 Click here to buy Prince of Thorns (Broken Empire #1) on Amazon.